Bali and beyond. A quick Indonesian getaway. Indonesia holds a very special place in my heart, to the point that I’m even considering moving there for a while. Still, it’s not the easiest place to travel in. Java has wonderful temples but it’s the typical crowded, dirty, overpopulated and freaked out Asian capital. Sumatra has lush forests and wonderful reefs, but the limited travel infrastructure and the strict Sharia law that is still enforced in the north can be a problem. Sulawesi and its funeral rituals have been on my bucket list for years now, but it’s far out and massive, meaning that transfers can take days. Which holds true for most of the Archipelago. As well as sleeping in creepy guesthouses, last minute transport fiascos and sudden and unpredictable rain in some parts of the country. For these reasons, a 2 or 3 weeks’ holiday can easily morph into a stressful Asian madness compilation. My suggestion for such a short period of time is to choose one or two islands and to stick to those. In Indonesia, Bali and the close Gili Islands, Lombok and Nusa Lembongan still represent a backpackers’ paradise despite the crowds and have so, so much to offer. 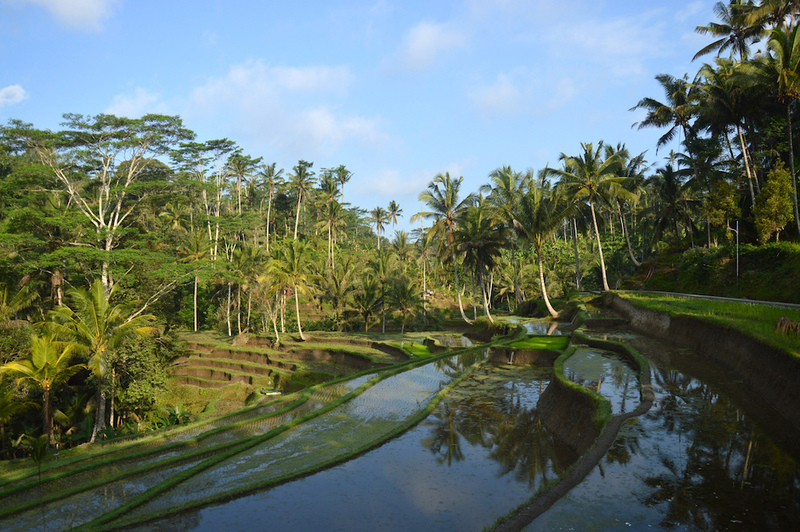 So here’s why a backpacking trip to Bali might be your best choice for a quick Indonesian getaway. 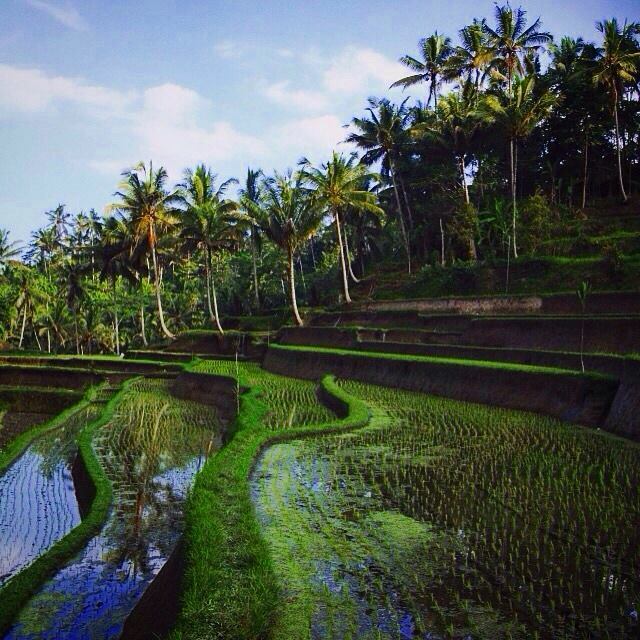 The heart of Bali is a lush jungle that gives way to rice fields. Driving a motorbike up and down its green hills dotted with temples and coffee plantations is one of the most rewarding experiences I ever had in Asia all together. You’ll also find dreamy beaches, clear water, incredible cliffs and rock formations. Balinese culture is what struck me the most. So gentle and delicate and still, so well preserved. Locals practice Balinese Hinduism, a distinct form of Hindu worship incorporating local animism, ancestor worship and reverence for Buddhist saints. Which to me looks like the best of everything. Temples and Gods statues are everywhere. They are attended daily for morning offers, prayers, traditional music and dance practice. 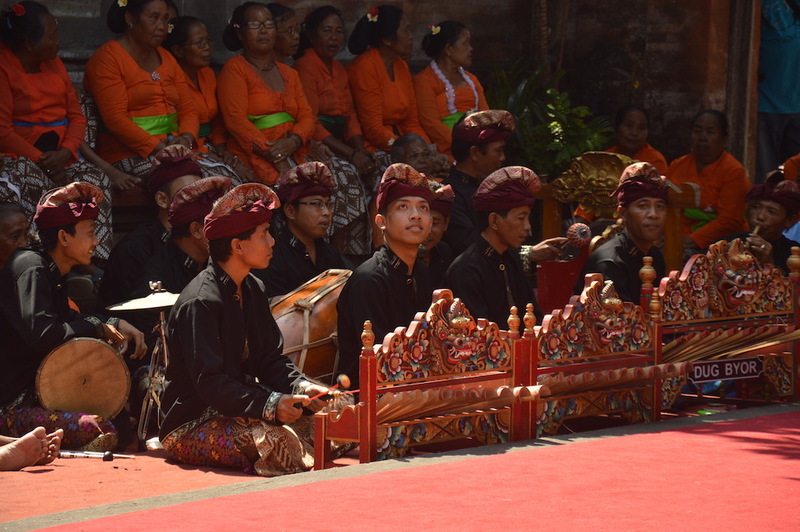 Every evening you’ll be immersed in Gamelan music coming from the temples, where the sunset prayer is accompanied by percussive instruments, xylophones and bamboo flutes. Their gentle religion also means that, as a girl (local and foreigner alike), you can comfortably walk around wearing shorts, tank tops, and summer chemises without being frown at. Of course you’ll have to cover up when entering a temple, but everywhere else you’ll be fine. As soon as you leave the most touristic areas, you’ll find traditional houses that look like temples, people that still wear the traditional longyi and shops that sell religious ornaments. in Bali you can dive in the north and on the east side of the island, and nearby islands are full of diving sites. 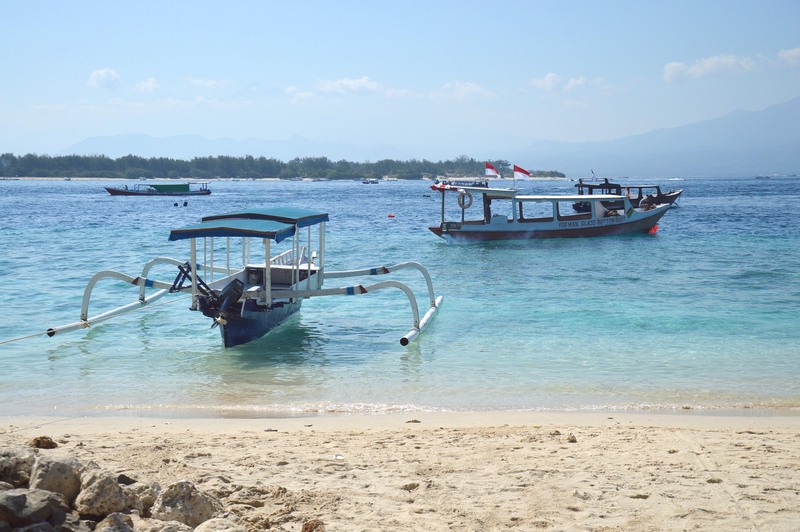 I snorkelled around the Gilis, which are surrounded by calm waters and wonderful reefs. You can even see turtles just swimming off the beach. You can either chose to trek between the rice fields or to climb Mount Batur (1700m) or Mount Agung (3000m) the two Balinese volcanos. But if you like volcano hiking your best choice is Mount Rinjani on Lombok, the third highest mountain in Indonesia (3700m). You’ll have plenty to choose from. Some are immersed in the jungle, others just pop up at crossroads. Tanah Lot, Uluwatu and Besakih Temple are just some of the most famous. Who knows me well knows I’m not a food lover. I grew up with a very basic diet and I tend not to appreciate food when it’s too spicy, too soy-saucy or just too strange looking. Which basically covers all Asian food. Thus said, food lovers swear that Balinese cuisine is one of the best of the region. In Bali it’s also possible to find many international options and very good grilled fish for those who also struggle with Asian food. Another reason that makes this area of Indonesia perfect for a quick getaway is the ease with which you can travel around. Bali is served by all mayor local and international airlines. Several ferry companies connect it with the neighbouring islands multiple times a day. Scooter renting is between the cheapest in South East Asia and even during peak season (June-August) you don’t need to reserve to find wonderful accommodations. We never spent more than 15$ for a double room, in places that ranged from lovely beach bungalows to local guesthouses with fancy open air jungle bathrooms, to beautiful traditional mini resorts with swimming pool, breakfast and batik throws on the beds. just 45 minutes of fast ferry away from Bali you will land on three paradise islands, without cars nor scooters, but just horses and chariots to move around. Gili T is the party Island, Gili Meno is a teeny tiny islet, very quiet and honeymoony, and Gili Air is the hippy happy place where we spent four days eating fresh grilled tuna and swimming with turtles. Equally blessed with amazing beaches, surf spots and thick jungle, Lombok is traditionally the quieter sister of Bali. For those that really are into hiking, here you can climb Indonesia second-highest volcano, which also fancies a crater-lake and some neighbouring hot springs where you can dip on your back from the summit. a surfers’ paradise that many define as “Bali 20 years ago”. For the true surfers or for those who really hate the crowds.